Wood is a wonderful, versatile building material that has been used for thousands of years to construct everything from walls and floors of the family home to the furniture and cabinetry that fill it. In order to keep wood functioning at its best and most beautiful, it needs to be protected from abrasion, chemicals, moisture, UV radiation, weathering, and attack from microbes such as fungi and mold. This is the job of wood coatings. With such a wide range of substrates (hardwood, softwood, MDF, aged wood, or green wood) and applications (exterior, interior, furniture, building, residential, industrial) it is no surprise that wood coatings is a billion dollar industry with a glut of players and products. In this article we provide an overview of wood coatings technologies and products, and the big brands and companies that make up the industry. As well as traditional coatings such as stains and varnishes we look at newer technologies such as powder coating, polyurethanes, and specialized wood coatings like anti slip and fire retardant/intumescent paints. Varnishes, shellacs, stains, lacquers, polyurethanes, epoxies, and other wood finishes all have properties which work best when paired with the right application. Which wood coating you need depends on the type of wood and the end use of the substrate. A lot of these terms are used to refer generally types of wood finishes, even though they denote a specific coating. Below is a brief description of different wood coating types and their properties. Polyurethane varnishes appear white but dry clear to protect the wood substrate. VARNISH – A varnish is a transparent protective finish that dries hard and usually glossy (though they can be matte or semi-gloss). The basic components of varnish are a drying oil, resins, and a solvent, and the resin can be acrylic, oil, polyurethane, epoxy, and others. A varnish is a hard-wearing finish which is suitable for both indoor and outdoor use as it is waterproof, durable, tough, and versatile. SHELLAC – A shellac is a softer form of finish which uses naturally-occurring resin (the shellac) dissolved in ethanol to provide a color and high-gloss finish for wood products. Shellac is now mostly used for furniture and instruments as it is not as durable as varnish, and alcohol spills will cause the shellac to dissolve. LACQUER – Lacquer is a form of finish in which the resin is dissolved in a solvent (unlike shellac which uses alcohol). It is harder than shellac, and is used to give a clear or colored shiny, glossy finish for furniture. The high VOC content in lacquer makes it a less popular option than water-based varnishes. STAIN – A wood stain is a coating which consists of dyes or pigments dissolved in a vehicle with a small amount of binder. When applied it soaks into the wood substrate and, depending on whether it is transparent or opaque, accentuates the wood grain or flatten out the wood with a color. Stains are used to give wood a particular color, and not for protective properties. If protection is needed a clear varnish is often applied over the top. Whether using paint, varnish, or stain it is important to use the correct application methods and processes. A primer cannot be used as a final topcoat, and though some topcoats can be applied as all-in-one systems, not all can. Understanding the types of wood finishes will mean a better coating job. Impregnation is a wood preservation method where protective chemicals are ‘impregnated’ into timber through the application of pressure. It makes the timber more durable and protects it from pests such as mold, fungi and insects. The preservatives are copper-based (a natural biocide), sodium silicate, thinned epoxy resins (preservative and sealer in one), or oil-based (coal-tar creosote). There are also fire-retardant impregnation chemicals which reduce the surface spread of flame, heat, and smoke. Impregnation is an industrial wood coating treatment used to protect telegraph poles, railway sleepers, outdoor structures such as decks and playground equipment, as a building material in domestic, commercial, and public buildings, and more. Polyurethanes are a common choice for wood coatings for floors as they are resilient and durable. When it comes to wood coatings, the intended end use of the wood is vital for choosing the coating system. Exterior wood needs all the protection it can get, and a primer not only protects the wood from the environment, but also prevents cedar bleed and tannin stain – where the tannins from the wood are drawn to the surface and stain the paintwork. Acrylic sealing primers are one such coating, that both seals and protects. 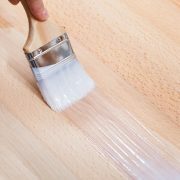 A primer also works to connect the wood substrate with the coating, ensuring adequate adhesion. Surface finishes are those that do not penetrate the wood. Decorative paints, varnishes, lacquers, and shellacs are surface finishes, and so they dry to form a protective film on top of the wood. A clear topcoat protects the layers beneath while enhancing the final finish and providing abrasion and stress resistance. When working with a stain (which is a penetrative coating), a varnish or other surface coating will enhance and protect the color. 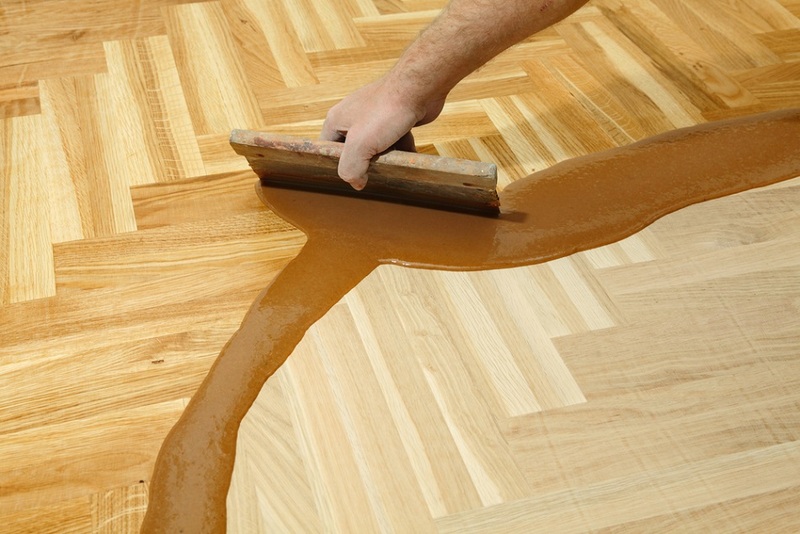 When it comes to wood floor finishes, polyurethane is the finish of choice. Polyurethane coating wood is durable, hard, versatile, and comes in a water-based formulation that is low-VOC and fast drying. A lot of high gloss polyurethane wood finish is applied before installation. A polyurethane wood finish is also used to protect exterior floors like decking as it is UV stable. Wood coatings are not just about protecting the substrate while letting the beauty of the wood shine through. With technologies improving all the time, it is possible to powder coat wood substrates now, as well as protecting them from fire or making a deck anti slip. Below is more information on these specialty wood coatings. Powder coating wood – Powder coating is the process of using electrostatic charge to cause a dry powder to adhere to a substrate and then baking and curing the powder in an oven. The resulting coating is immensely durable and attractive, as well as being environmentally friendly due to the lack of solvent. Powder coating wood is now gaining widespread popularity, particularly for coating furniture. Intumescent/fire retardant paint for wood – Fire is one of the greatest dangers for wood. There are two coatings that act as passive fire protection measures for wooden substrates: intumescent and fire retardant coatings. Intumescent coatings swell up in the presence of extreme heat, forming a protective layer of char between the wood and the fire. Fire retardant paints work by releasing flame-damping gases to prevent ignition. Anti skid paint for wood – Wood floor finishes can be very slippery when wet, whether decking, stairs, ramps, or walkways. Anti skid paint works through the inclusion of a non-slip aggregate or by creating a rough surface that provides more grip in wet or dry conditions. The wood coating market is filled with recognizable and trusted brands and products. In the US, some of the big players are Sherwin-Williams, Axalta, Rust-Oleum, Dow Coating Materials, and PPG through brands such as Flood, Sikkens, and Sher-Wood. The wood coatings market is being driven by a rebound in the housing market with flow-on effects in furniture, siding, and decking. Below is a small selection of the products available for US consumers. If you would like more information about the best wood coatings for your project, let us know! Our experts are here to help. In collaboration with our coating partners, we will find the coating solution for your needs and help you to get the best results possible for your project’s finish. Simply click the button below and tell us a little about your project to get started. The quote service is completely free, get in touch today! PPG Proluxe Transparent Matte – Cetol SRD Wood Finish A one-coat, transparent exterior wood finish for siding, railings and decks. Solvent-based penetrative coating in a range of colors. Sherwin-Williams Wood Classics Polyurethane Varnish A solvent-based polyurethane finish with a satin or high gloss finish. For interior floor use.